Despite all the headlines about the upcoming trade summit with China, it’s interest rate expectations that are more likely driving the financial markets. Yes, a trade war with China is bad for both countries (and the global economy) and a resolution would certainly be good news for stocks. However, from a global perspective, interest rate levels are far more impactful on the markets. What happens with interest rates, or more precisely, with interest rate expectations, has a rippling effect across multiple asset classes. Changing interest rates affect housing prices, commodity prices, companies with a lot of debt, companies looking to borrow, consumer spending, and everything in between. So, when Fed Chair Powell seemed to back off on another interest rate hike in December, it’s not a huge surprise that stocks rocketed higher. On the other hand, rather than go down (or do nothing), long-term interest rates actually appeared to go a bit higher. The iShares 20+ Year Treasury Bond ETF (NASDAQ: TLT) is a very common way to track long rates and is probably the most heavily traded ETF related to interest rates. 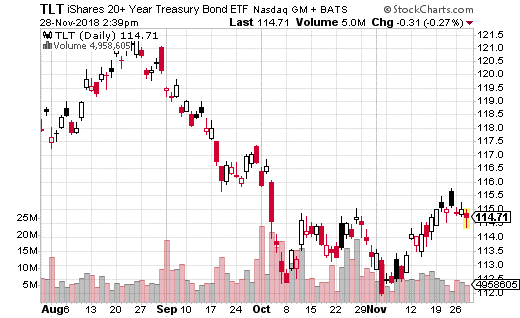 TLT tracks bond prices which move inversely to interest rates. You can see from the chart that TLT dropped after Powell made his dovish statement on interest rates. While the ETF definitely recovered from its lows, it certainly did not move higher – which many investors may have expected with the Fed potentially pausing its rate increase timeline. First off, bond prices are very forward looking, and the Fed pausing a rate hike is probably a temporary situation. It’s not likely at this point that rates are going to go back down. That could change at some point, but clearly bond traders don’t believe now is that time. What’s more, the Fed generally operates at the front-end of the Treasury yield curve. That is, it pulls levers which impact short-term rates. TLT is based on long-term rates. While short-term rates clearly have a direct effect on long-term rates, they don’t always have to move in unison. The shape of the yield curve can change as well (long and short rates moving at different times, to different extents). A well-capitalized trader purchased 10,000 of the TLT December 21st 113-114 put spreads for $0.43 with TLT trading at $114.70. That means the trader bought the 114 puts and simultaneously sold the 113 puts. The total dollar cost of the trade is $430,000, which is also the max loss if TLT remains above $114 on December expiration. However, if TLT drops to $113 or below, the trader makes $570,000, or 133% gains. Keep in mind, TLT only needs to drop $1.70 over the next 3 weeks for max gain to be reached. That’s only a 1.5% move in the ETF. Basically, the trader is betting on (or hedging against) a small drop in bond prices (or a slightly higher move in long-term interest rates) by the end of the year. You many not think that a $1 wide put spread is going to be very lucrative, but as you can see, it only takes a small move in TLT for the trade to generate 133% in profits. If you think rates are going higher or want to protect against the scenario, this trade is a cheap, easy way to do so. Now accepting new registrations. Click here to start.